Some sad stories have a happy ending. Maybe it was Squirt’s time. Maybe he had an underlying illness. Whatever the case, Mallory Jackson walked into her custom framing shop on Bay Street in Port Orchard just about a year ago to find her nearly 17-year-old cat, Squirt, beloved mascot of Custom Picture Framing on Bay Street, curled up in his basket but not asleep, no, dead. Squirt must have died some time over the holiday. He had seemed fine on New Year’s Eve as he and Jackson spent the day together, she working, he presiding, as was his way. There was the ritual brushing at the end of the work day, the play time. The cat was well accommodated and used to spending Sundays in the store solo. On Monday, she found him. The loss of Squirt was “horrible,” Jackson said. She was not eager to get a new cat, but in August, at an animal adoption event hosted by the Kitsap Humane Society, there was one that caught her eye. He was orange, like Squirt, and he was missing his right front leg. The cat was found by Good Samaritans in July, shot in the chest with BB’s, his leg fractured in several places. 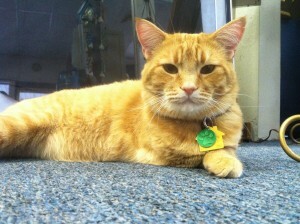 A vet in Central Kitsap tended to the cat and had no choice but to amputate the leg. The humane society handled the placement, when the cat was well enough to go to a new home. The cat was still there. She called him Scooter Kitty, and after some initial shyness, he has taken over the frame shop, winning the hearts of Jackson and her customers, much as did Squirt. Scooter Kitty’s loss of a leg doesn’t hamper him much. He jumps up on tables with ease and “he’s so darn fast,” Jackson said. The two are a good fit. “He just needed a home, and I needed a cat,” she said. 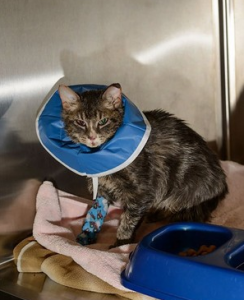 More happy news out of a sad situation: the cat we reported on in October that had been bound in tape and set on fire recovered well and is now happy in her new home. There are no leads in this horrific case of animal abuse. The cat was found in a flower bed near Orchard Heights Elementary School. She was brought to Cedar Creek Animal Hospital and treated for hypothermia as well as burns that took the tips of her ears but fortunately did no more significant damage. Remarkably, the cat not only trusted humans after its ordeal, but was outright affectionate. “All she wants to do is jump in your lap and purr,” said clinic owner Dr. Mike Alberts. One of the people who brought her in has adopted the young female cat and named her Marvel. And while we’re on the topic of sad cat tales with a silver lining, let’s not forget the story of James Raasch, who took in a stray cat while stationed with the Navy in Naples, Italy. The cat was his companion for more than a decade, but when he relocated to Bremerton, the cat went missing. Raasch moved to California and gave the cat up for gone, hoping her Italian street smarts would keep her safe. Odie, as he called her, took up with a feral cat colony and was located by the Kitsap Humane Society, which monitors feral cat populations. Information on a microchip embedded beneath Odie’s fur reunited the two, when Raasch came to Kitsap for a wedding. Odie seemed almost instantly to recognize her owner. She is now living in California, happy to be home, wherever that might be. The Kitsap Humane Society is temporarily waiving adoption fees on cats older than one year of age, during a “Feline Frenzy” event this weekend. The offer, good through Sunday, is intended to boost adoptions in response to an unexplained influx of cats. As many as 10 cats a day are being brought into the shelter. The rate in May has been 20 percent higher than the same time last year, leaving the shelter with limited kennel space. KHS encourages adopters to make a donation to help offset its costs. The shelter takes in any homeless animal in need for any reason.